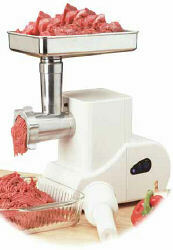 Make quick work of all your meat processing with this Heavy Duty 575 Watt Meat Chopper. With an output speed of 3-4 lbs per minute, you can grind through all your meat in no time.The compact design stores easily and keeps your counter top free of clutter. Use the included sausage stuffing accessory for perfect sausage every time. Dimensions: 14 X 5.8 X 11"